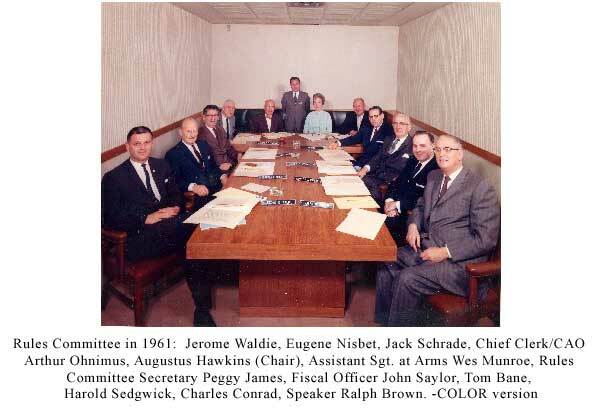 Click on the descriptions below to view the document. 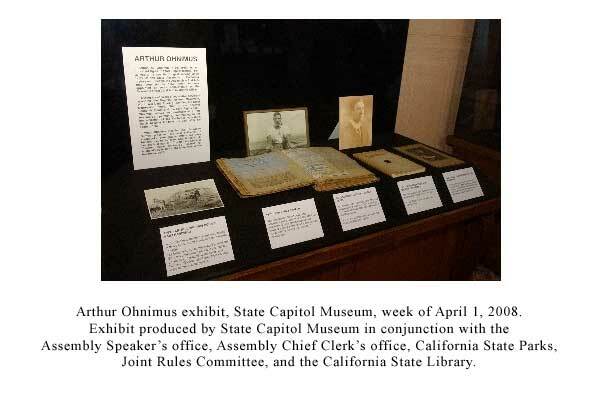 Arthur Ohnimus exhibit, State Capitol Museum, week of April 1, 2008. 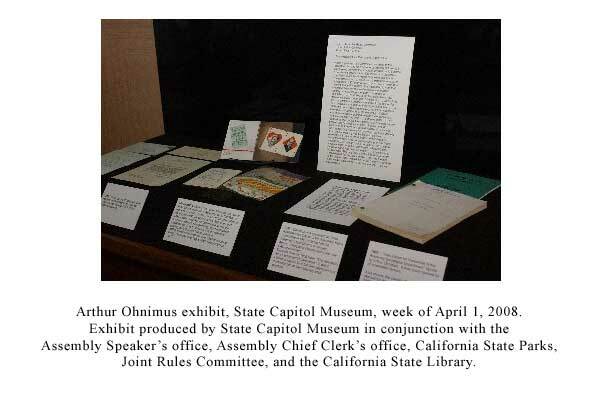 Exhibit produced by State Capitol Museum in conjunction with the Assembly Speaker's office, Assembly Chief Clerk's office, California State Parks, Joint rules Committee, and the California State Library. 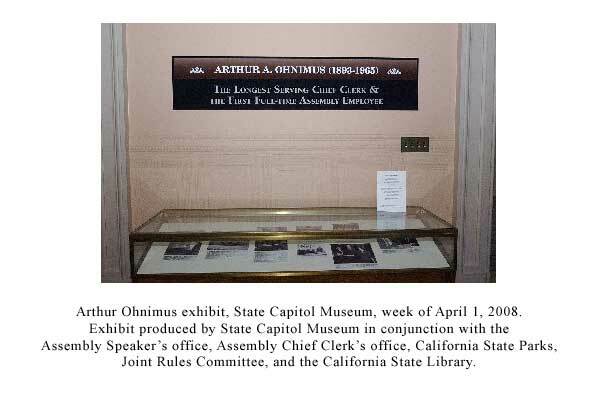 Arthur Ohnimus exhibit, State Capitol Museum, week of April 1, 2008. 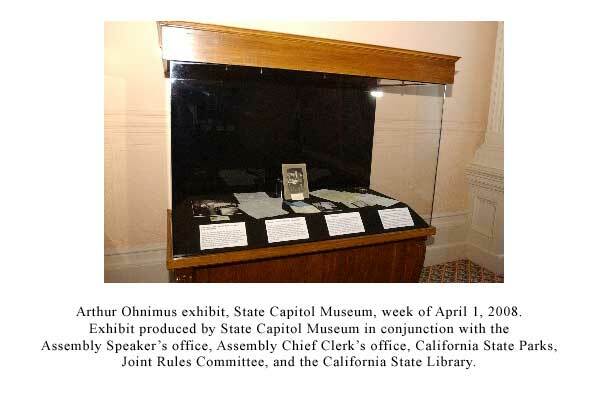 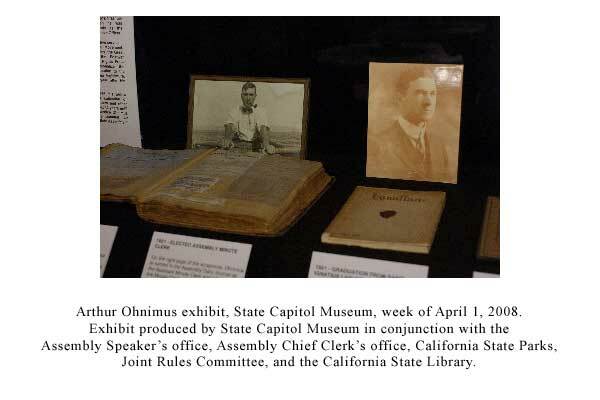 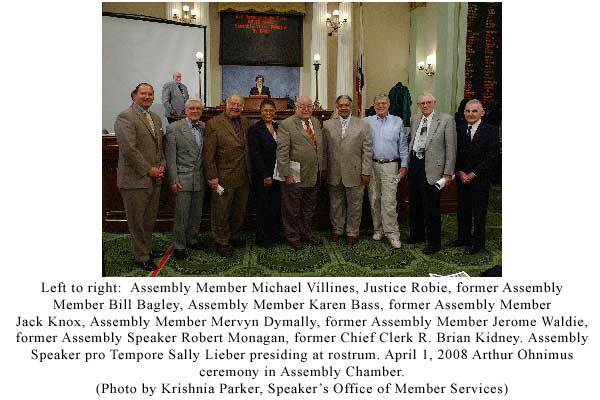 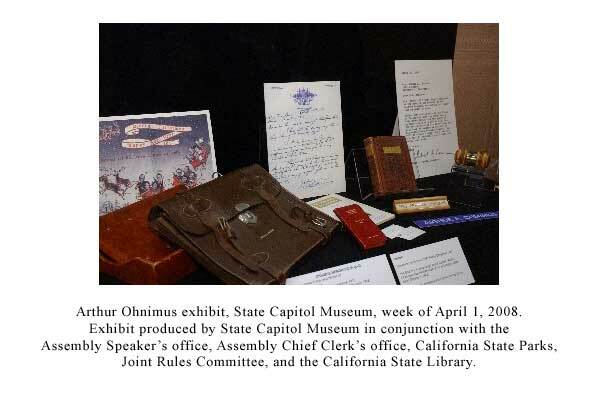 Exhibit produced by State Capitol Museum in conjunction with the Assembly Speaker's office, Assembly Chief Clerk's office, California State Parks. 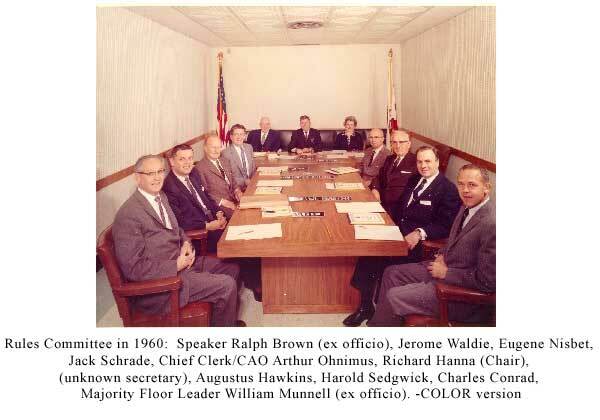 Joint Rules Committee, and the California State Library. 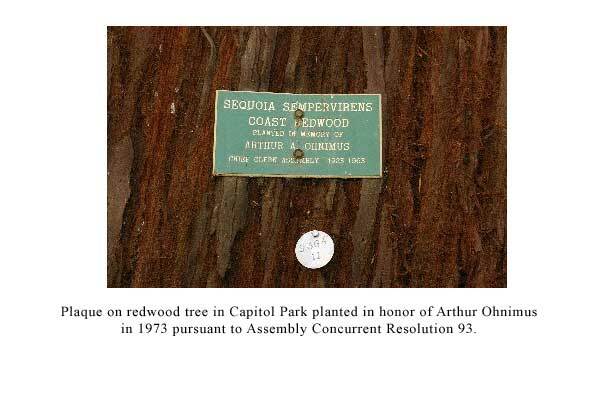 Plaque on redwood tree in Capitol Park planted in honor of Arthur Ohnimus in 1973 pursuant to Assembly Concurrent Resolution 93. 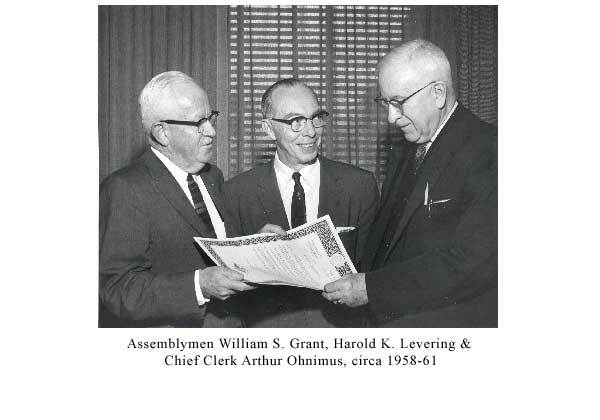 Chief Clerk Arthur Ohnimus, former Speaker Charles Lyons, Supt. 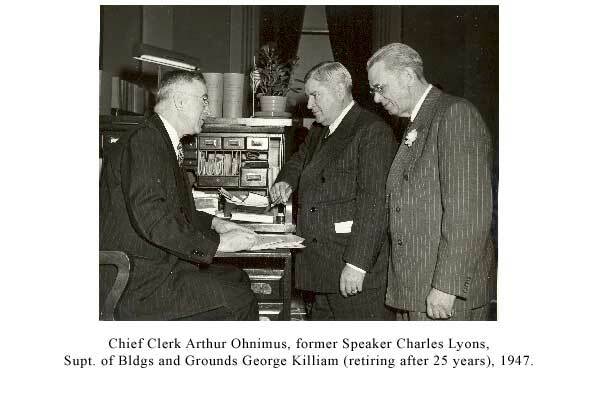 of Bldgs and Grounds George Killiam (retiring after 25 years), 1947. 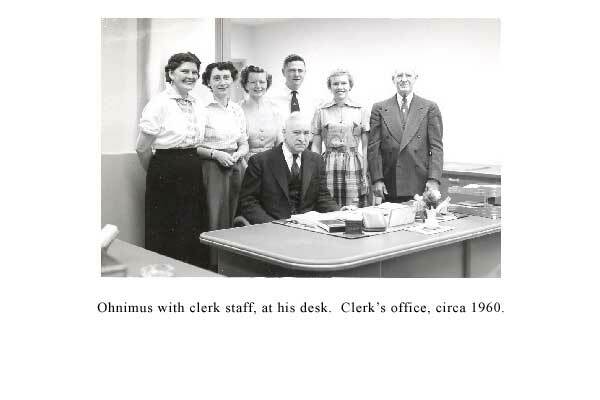 Ohnimus with clerk staff, at his desk. 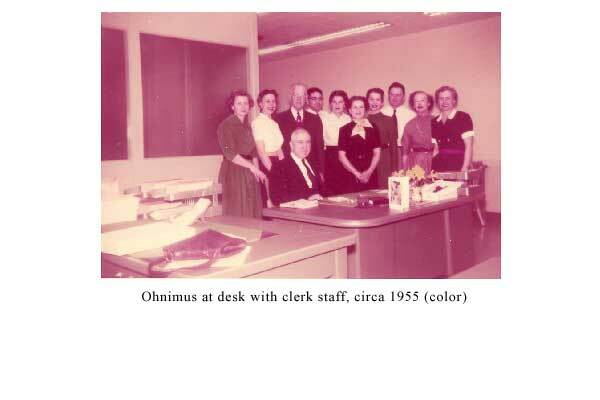 Clerk's office, circa 1960. 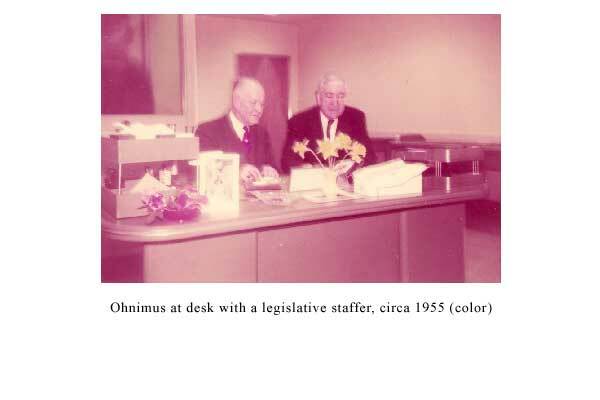 Ohnimus reviewing the rules with incoming Chief Clerk James Driscoll in 1963. 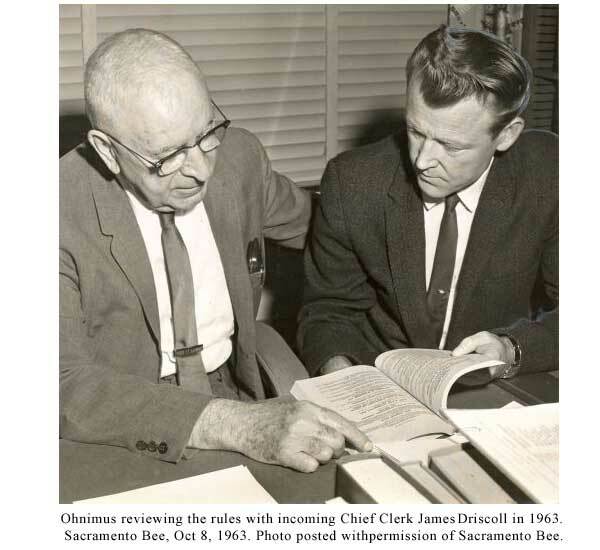 Sacramento Bee, Oct 8, 1963. 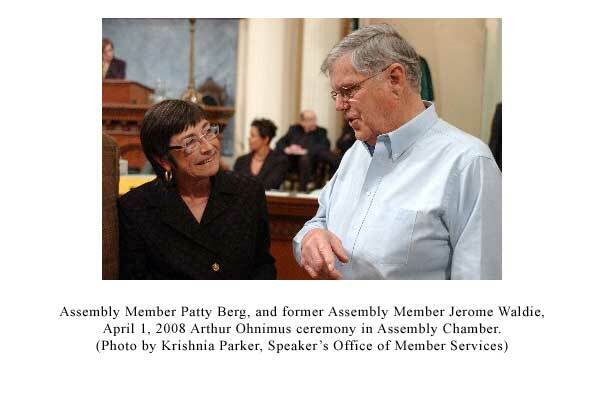 Photo posted with permission of Sacramento Bee. 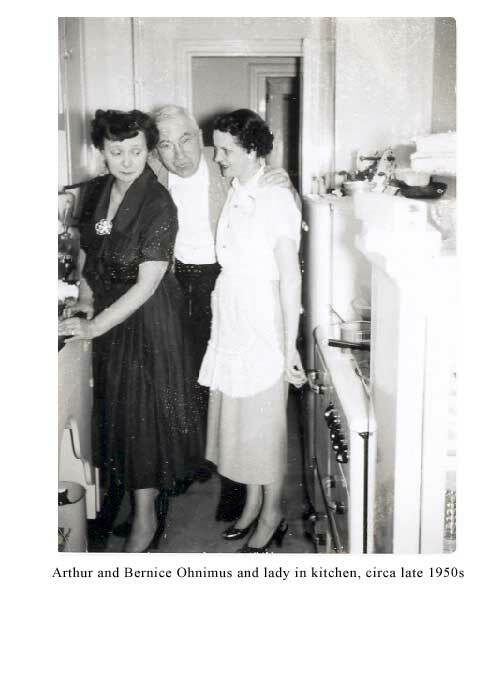 Arthur Ohnimus, Charles Johnson, and Harvey Chester on set of television show, circa 1950s. 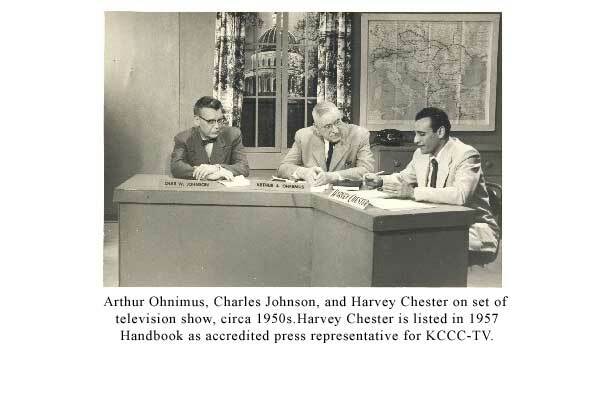 Harvey Chester is listed in 1957 Handbook as accredited press representative for KCCC-TV. 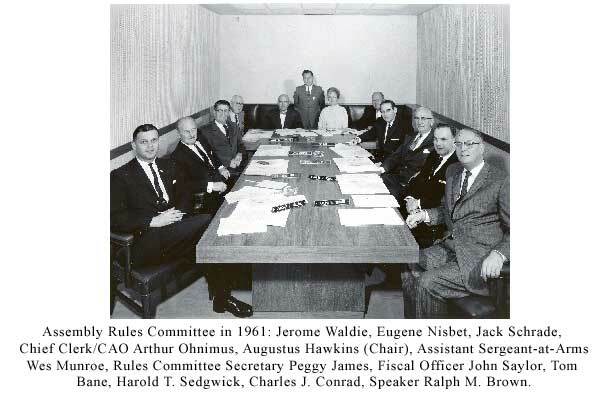 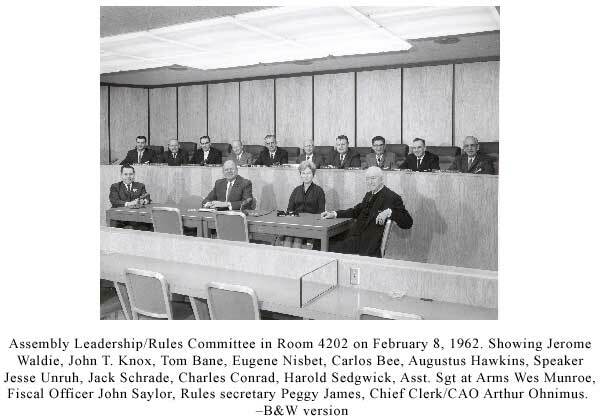 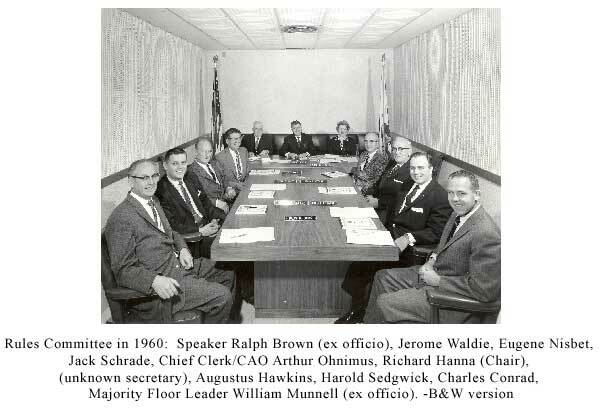 Assembly Rules Committee in 1961: Jerome Waldie, Eugene Nisbet, Jack Schrade, Chief Clerk/CAO Arthur Ohnimus, Augustus Hawkins (Chair), Assistant Sergeant-at-Arms Wes Munroe, Rules Committee Secretary Peggy James, Fiscal Officer John Saylor, Tom Bane, Harold T. Sedgwick, Charles J. Conrad, Speaker Ralph M. Brown. 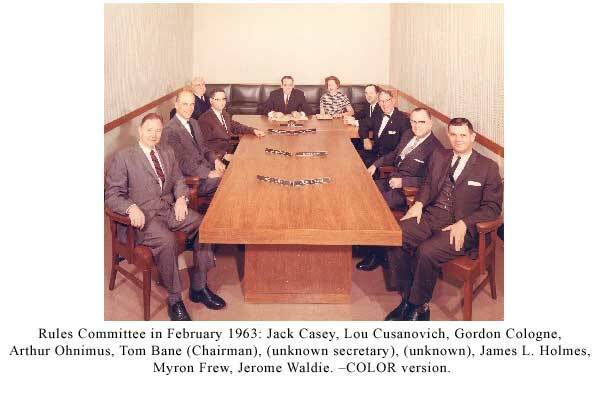 Rules Committee in February 1963: Jack Casey, Lou Cusanovich, Gordon Cologne, Arthur Ohnimus, Tom Bane (Chairman), (unknown secretary), (unknown), James L. Holmes, Myron Frew, Jerome Waldie. 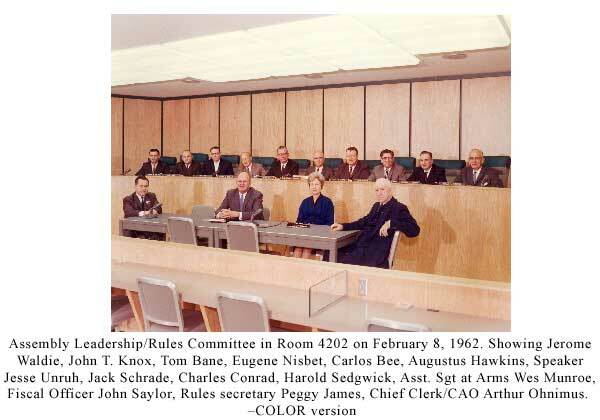 -COLOR version. 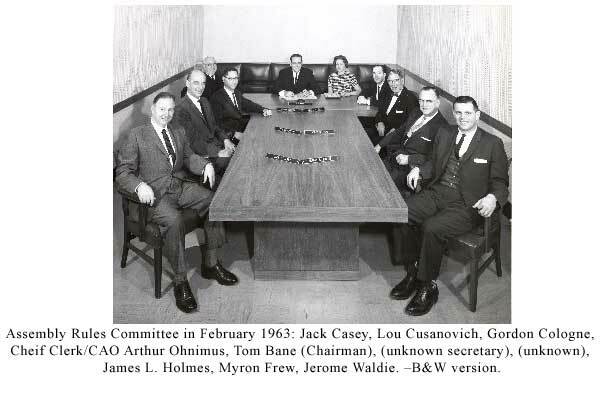 Assembly Rules Committee in February 1963: Jack Casey, Lou Cusanovich, Gordon Cologne, Arthur Ohnimus, Tom Bane (Chairman), (unknown secretary), (unknown), James L. Holmes, Myron Frew, Jerome Waldie. 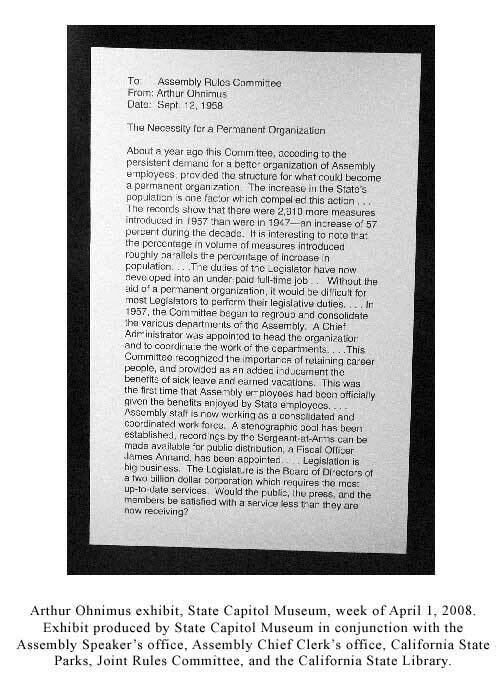 -B&W version. 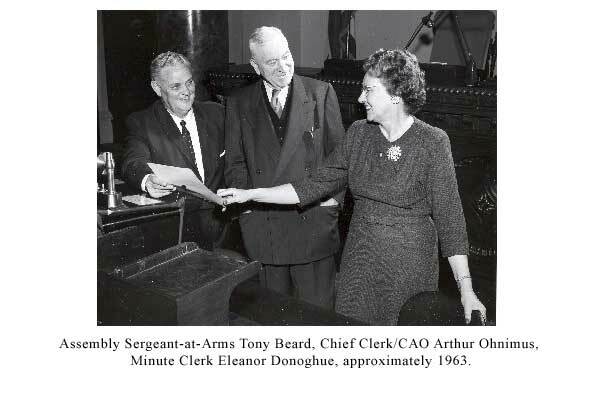 Assembly Sergeant-at-Arms Tony Beard, Chief Clerk/CAO Arthur Ohnimus, Minute Clerk Eleanor Donoghue, approximately 1963. 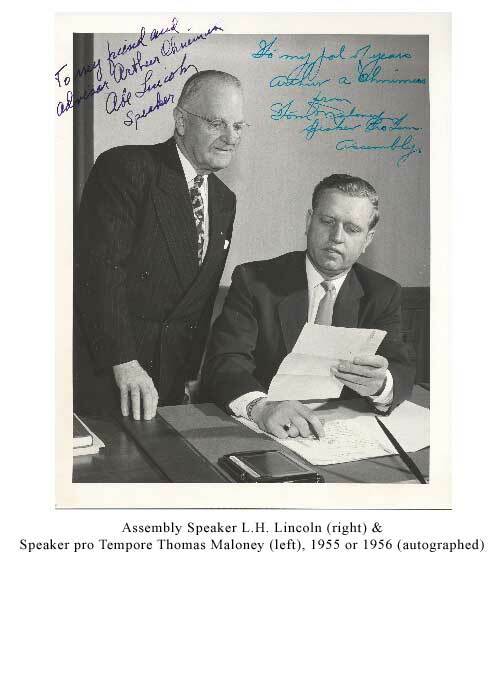 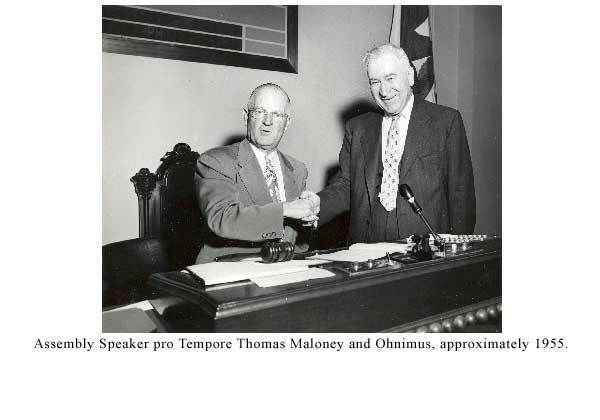 Assembly Speaker pro Tempore Thomas Maloney and Ohnimus, approximately 1955. 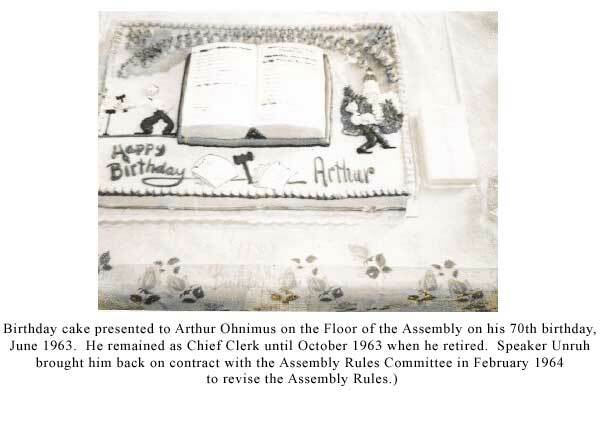 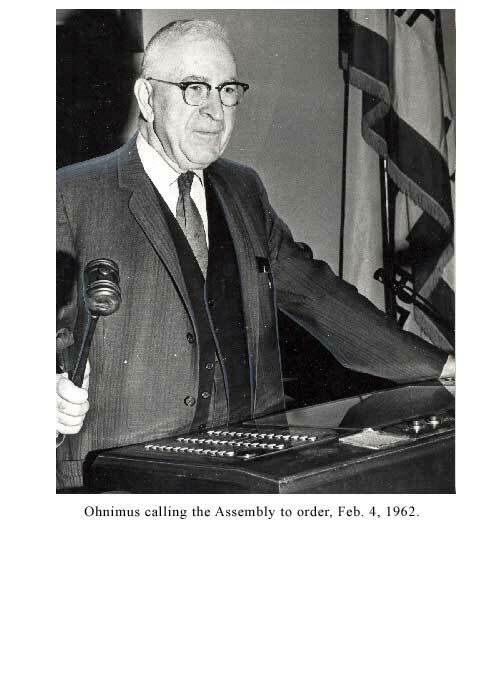 Ohnimus calling the Assembly to order, Feb 4, 1962. 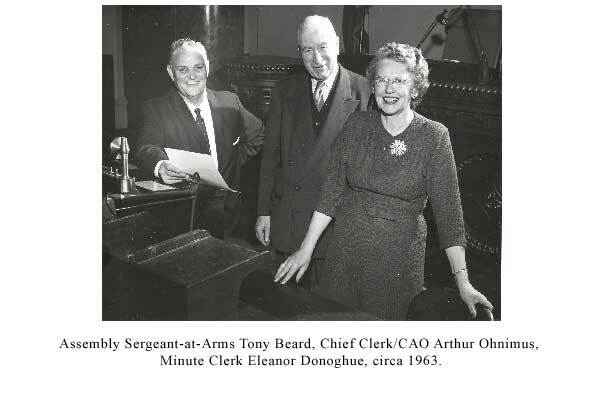 Assembly Sergeant-at-Arms Tony Beard, Chief Clerk/CAO Arthur Ohnimus, Minute Clerk Eleanor Donoghue, circa 1963. 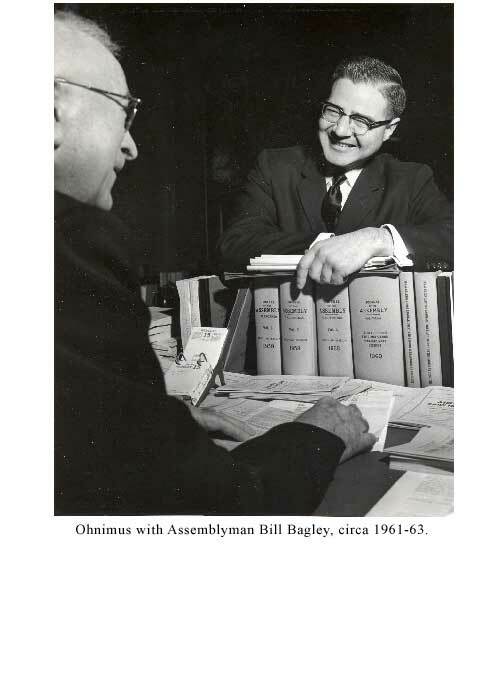 Ohnimus with Assemblyman Bill Bagley, circa 1961-63. 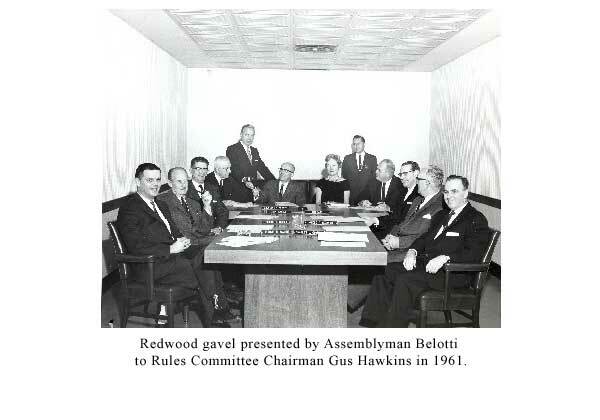 Redwood gavel presented by Assemblyman Belotti to Rules Committee Chairman Gus Hawkins in 1961. 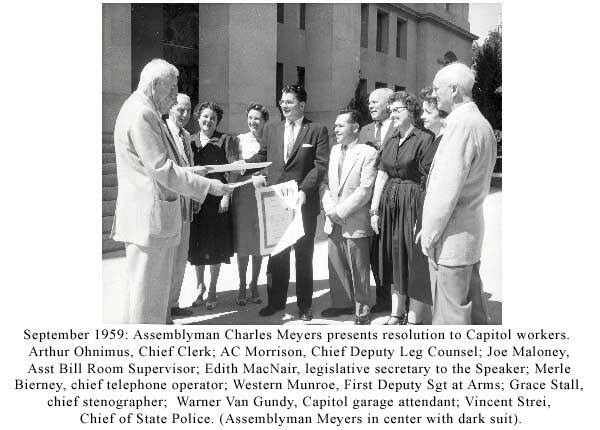 September 1959: Assemblyman Charles Meyers presents resolution to Capitol workers. 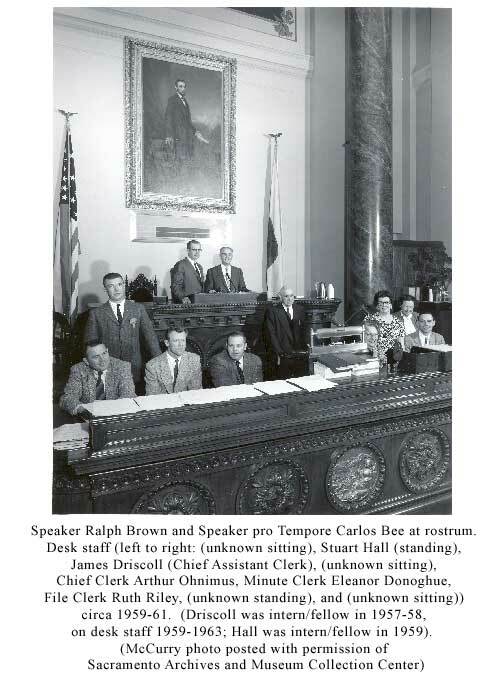 Arthur Ohnimus, Chief Clerk; AC Morrison, Chief Deputy Leg Counsel; Joe Maloney, Asst Bill Room Supervisor; Edith MacNair, legislative secretary to the Speaker; Merle Bierney, chief telephone operator; Western Munroe, First Deputy St at Arms; Grace Stall, chief stenographer; Warner Van Gundy, Capitol garage attendant; Vincent Strei, Chief of State Police. 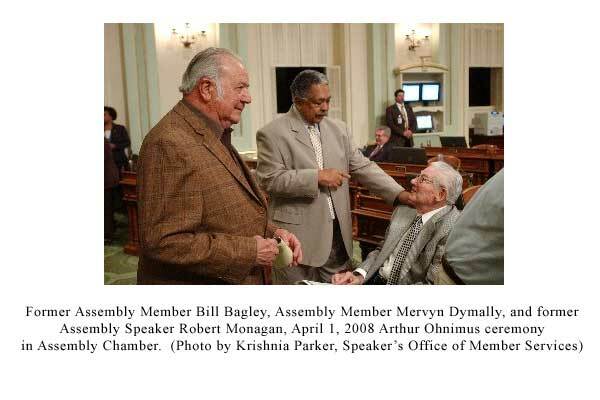 (Assemblyman Meyers in center with dark suit). 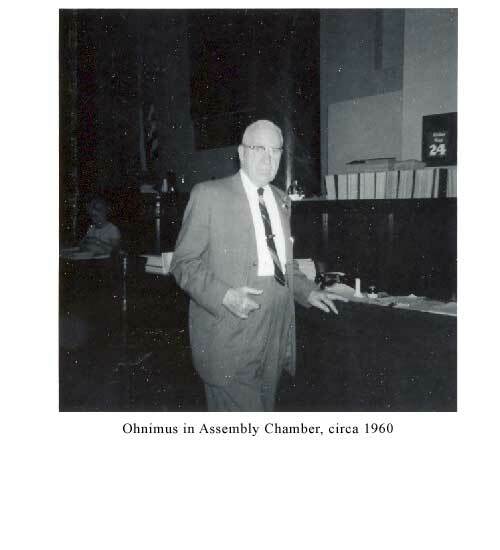 September 1959. 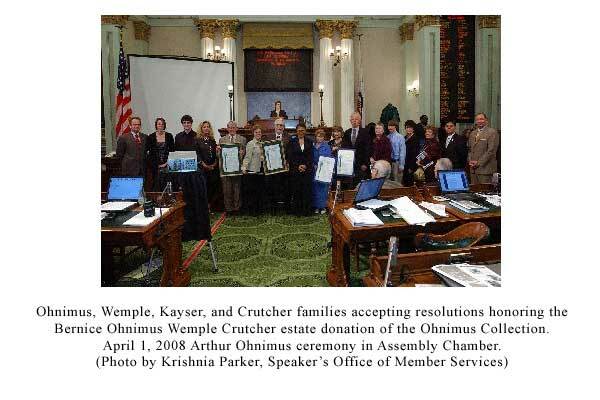 Assemblyman Charles Meyers presents resolution to Capitol workers. 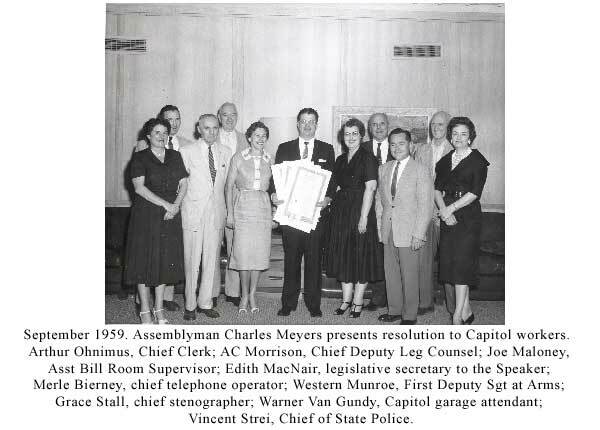 Arthur Ohnimus, Chief Clerk; AC Morrison, Chief Deputy Leg Counsel; Joe Maloney, Asst Bill Room Supervisor; Edith MacNair, legislative secretary to the Speaker; Merle Bierney, chief telephone operator; Western Munroe, First Deputy Sgt at Arms; Grace Stall, chief stenographer; Warner Van Gundy, Capitol garage attendant; Vincent Strei, Chief of State Police. 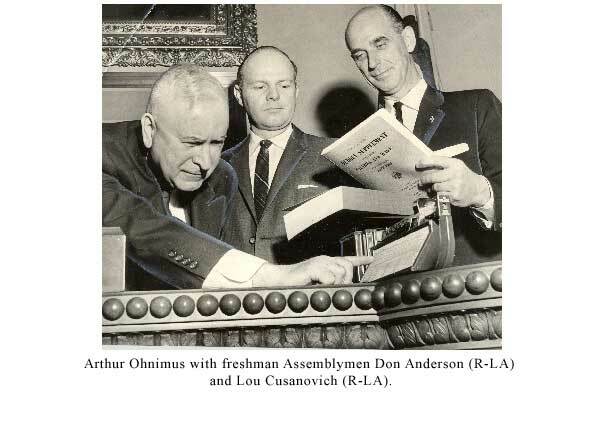 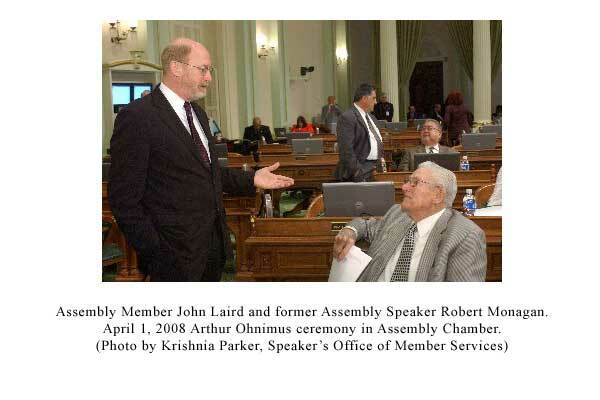 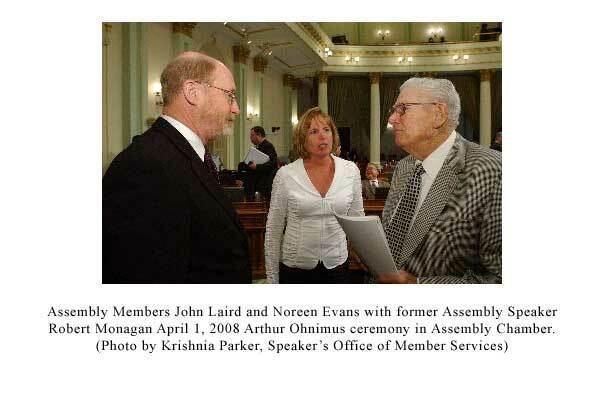 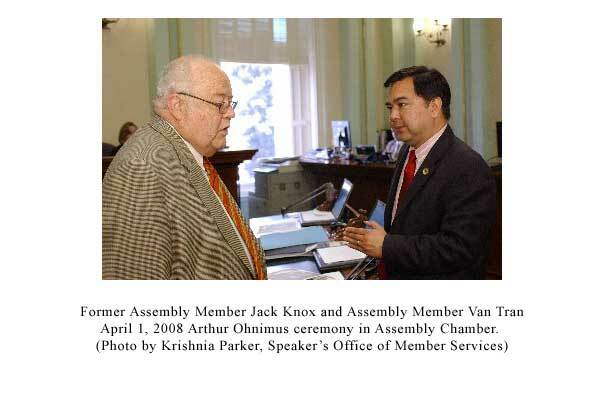 Arthur Ohnimus with freshman Assemblyman Don Anderson (R-LA) and Lou Cusanovich (R-LA). 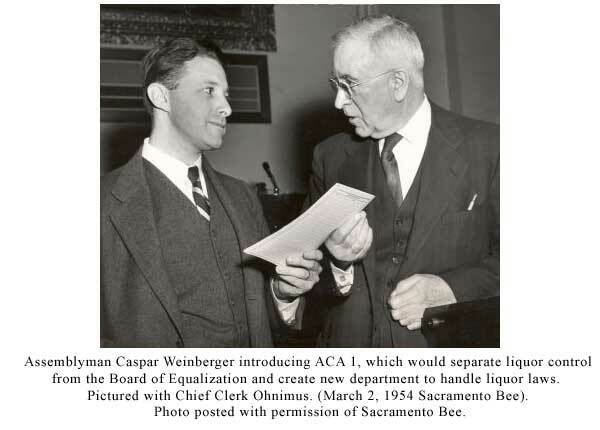 Assemblyman Caspar Weinberger introducing ACA 1, which would separate liquor control from the Board of Equalization and create new department to handle liquor laws. 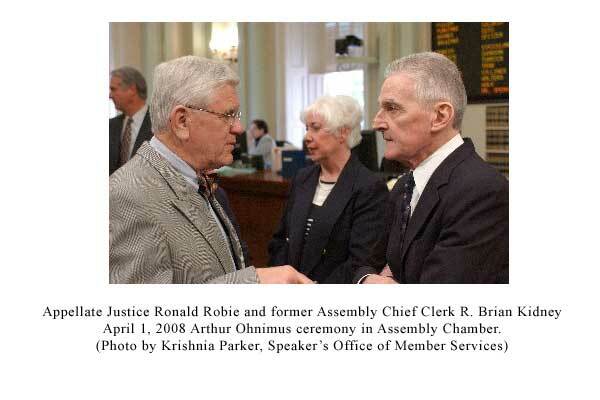 Pictured with Chief Clerk Ohnimus. 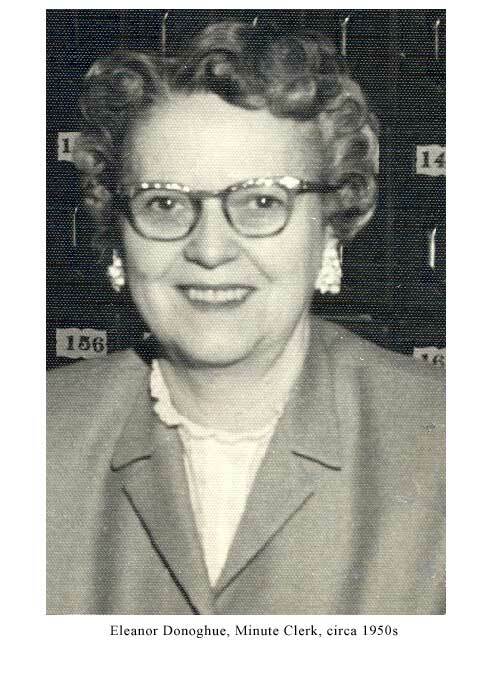 (March 2, 1954 Sacramento Bee). 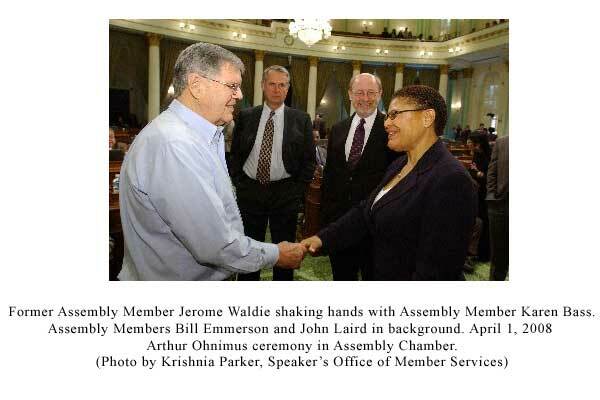 Photo posted with permission of Sacramento Bee. 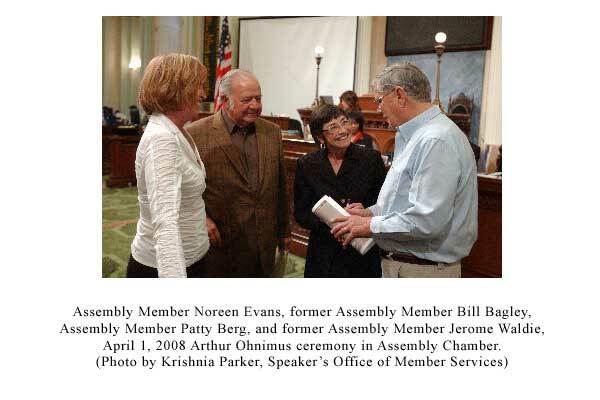 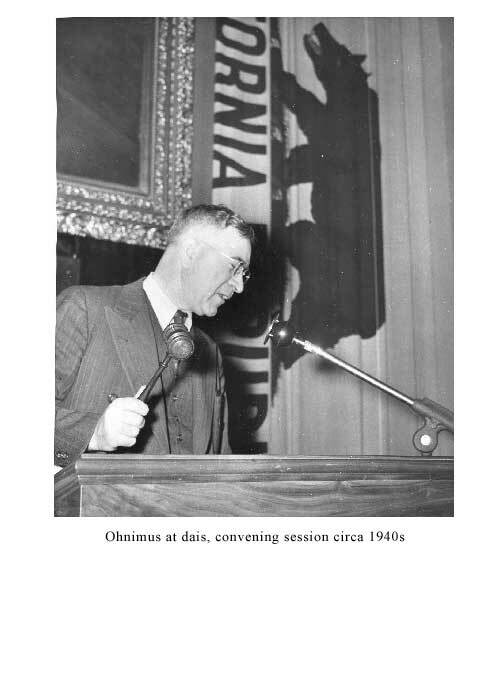 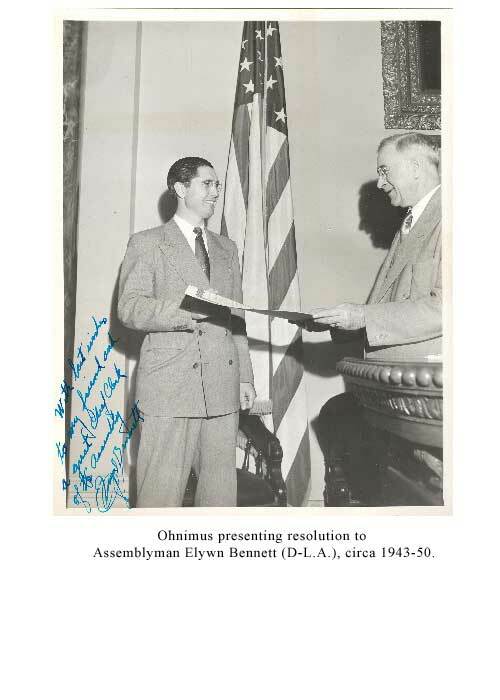 Ohnimus presenting resolution to Assemblyman Elywn Bennett (D-LA), circa 1943-50. 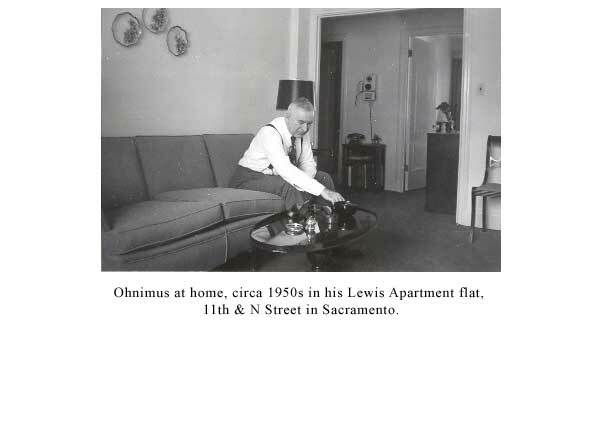 Ohnimus at home, circa 1950s in his Lewis Apartment flat, 11th and N Street in Sacramento. 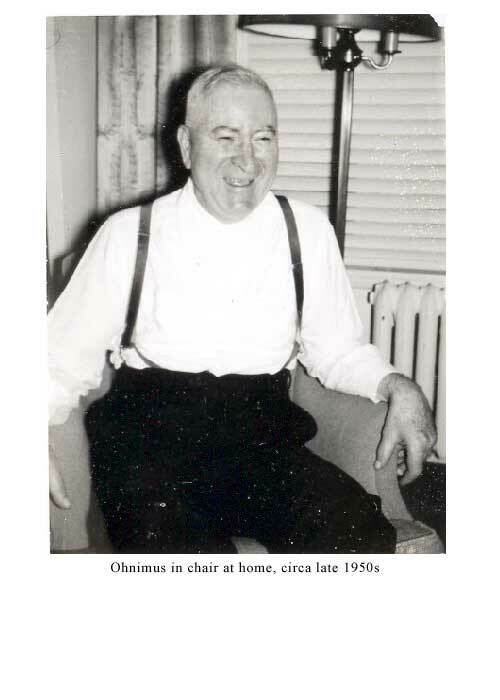 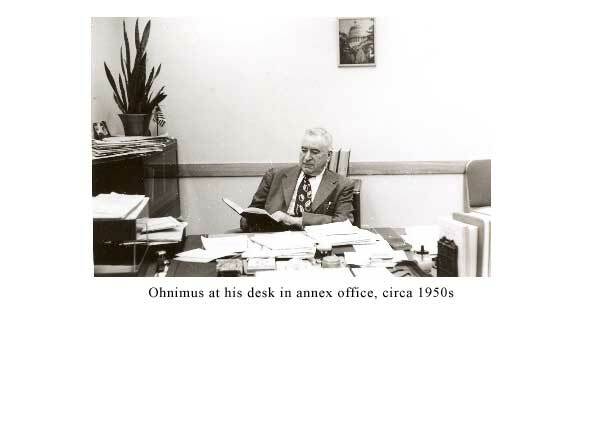 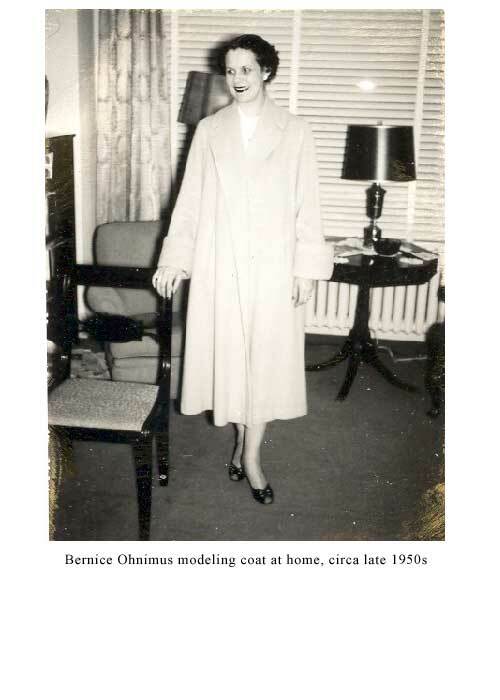 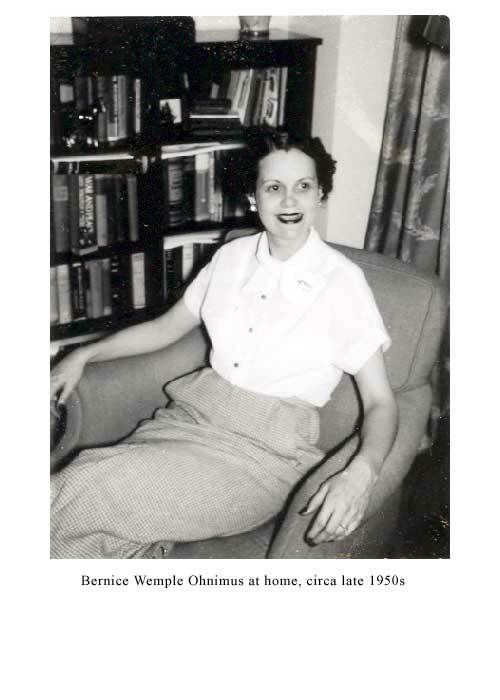 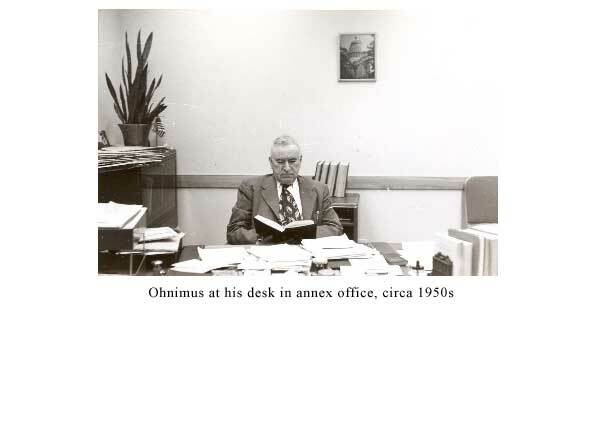 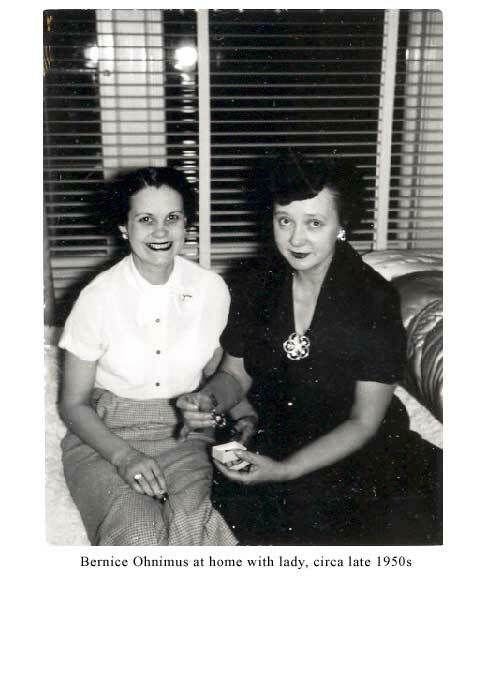 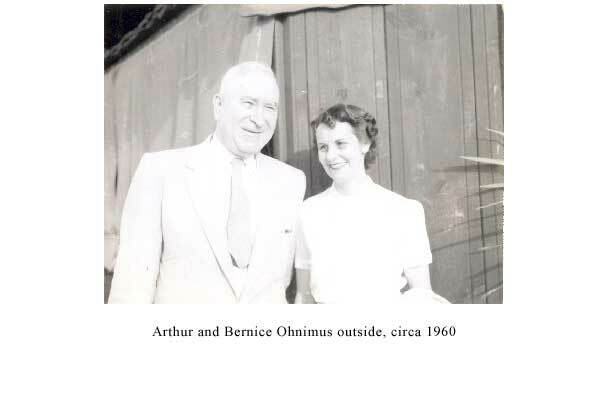 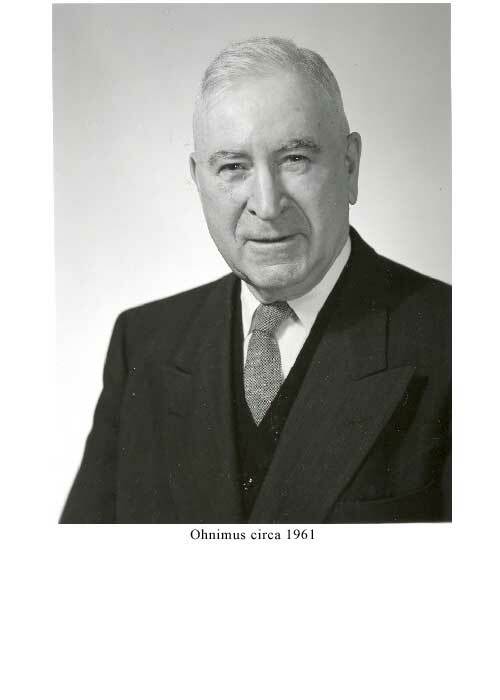 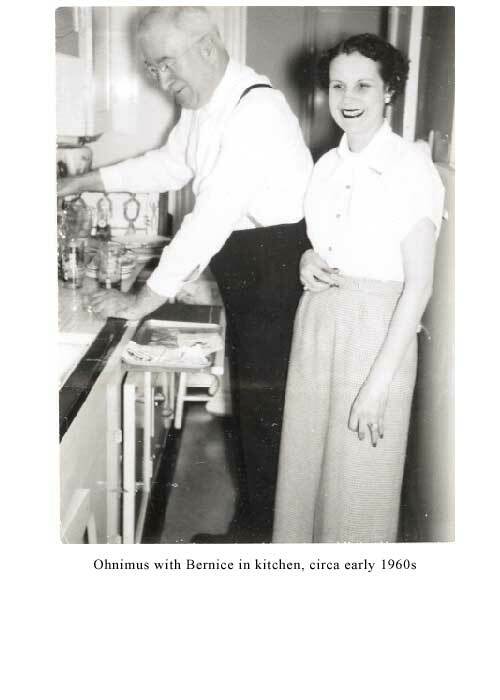 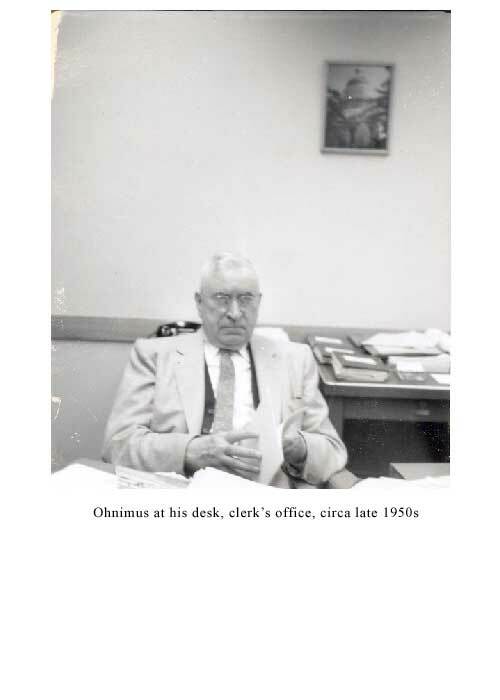 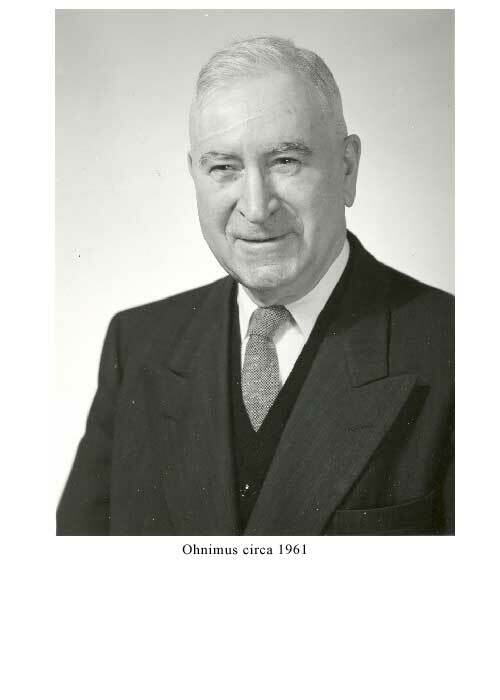 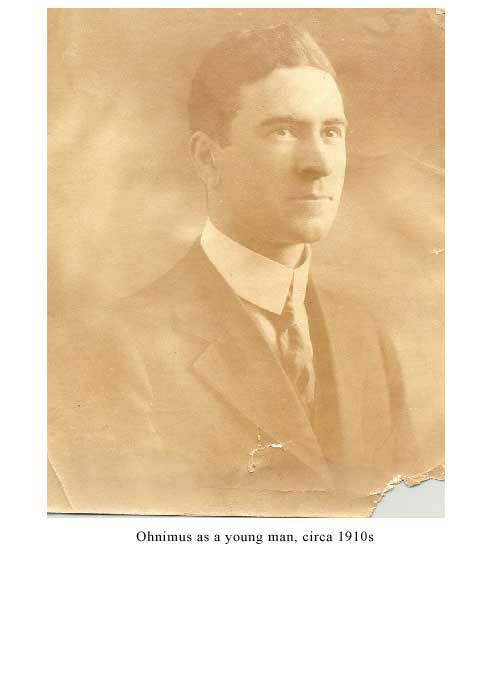 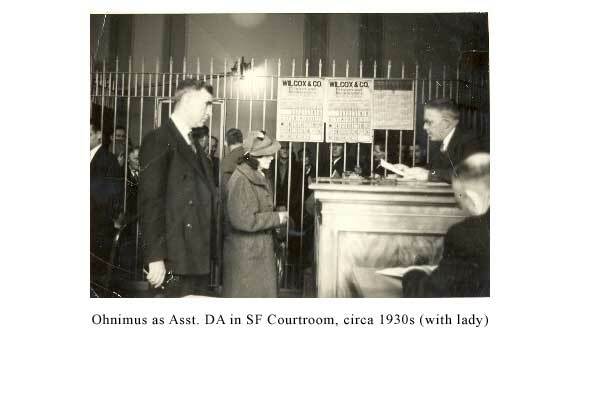 Ohnimus presiding, circa late 1940s-early 1950s. 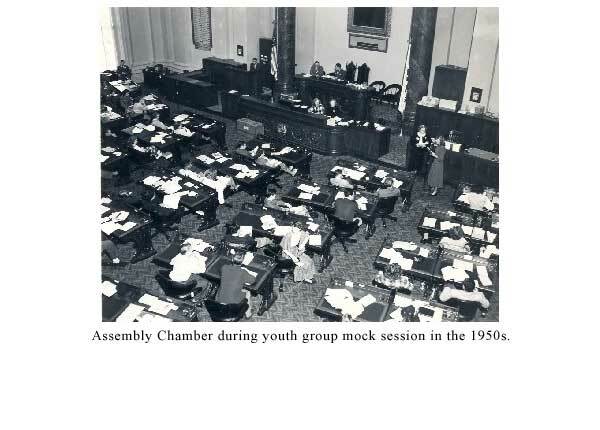 Assembly Chamber during youth group mock session in the 1950s. 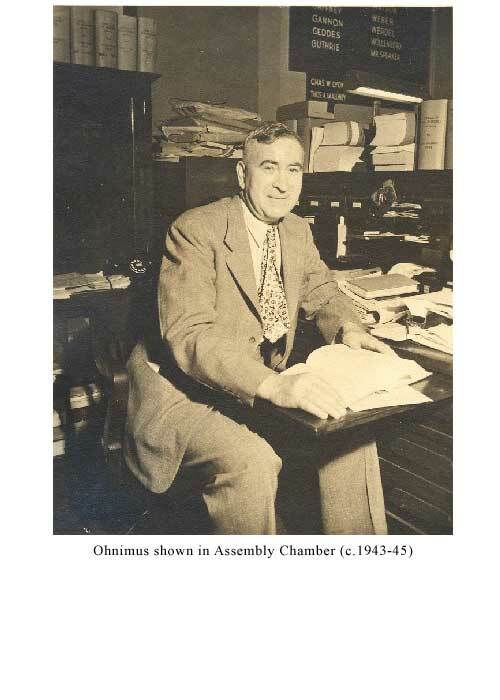 Ohnimus at a Member's desk in Assembly Chamber, 1925. 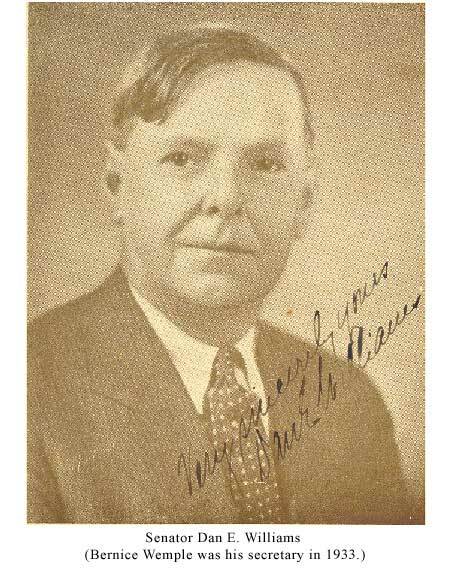 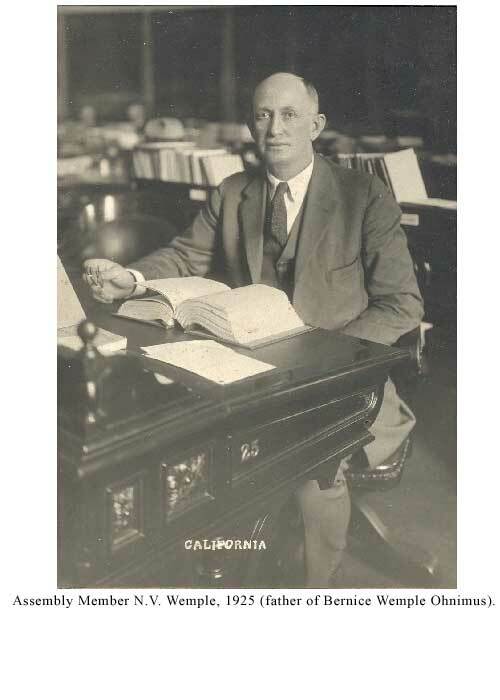 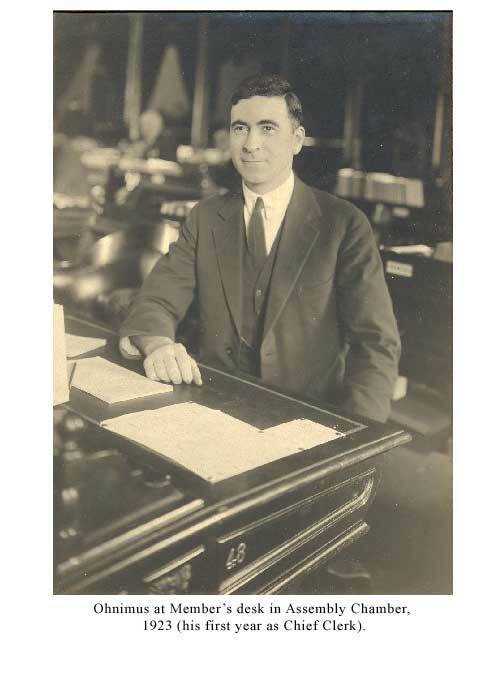 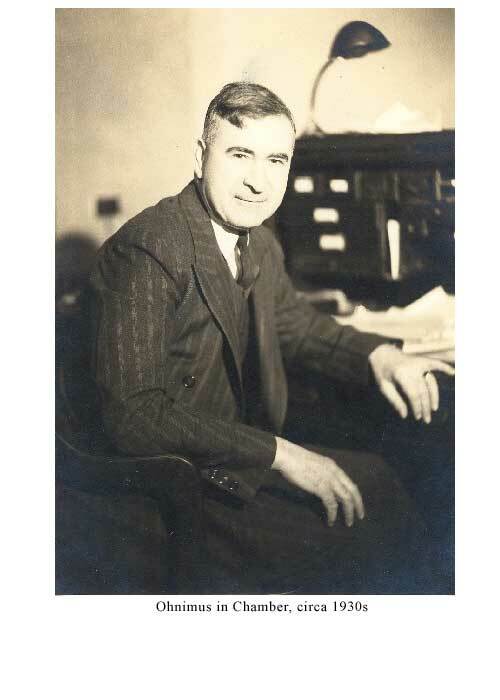 Assembly Member N.V. Wemple, 1925 (father of Bernice Wemple Ohnimus). 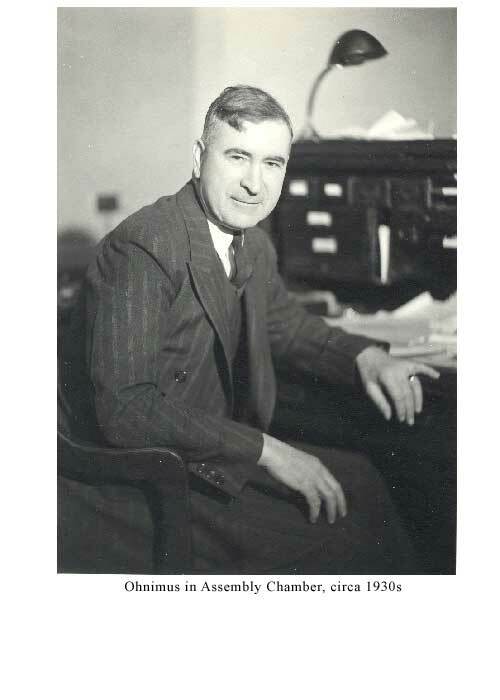 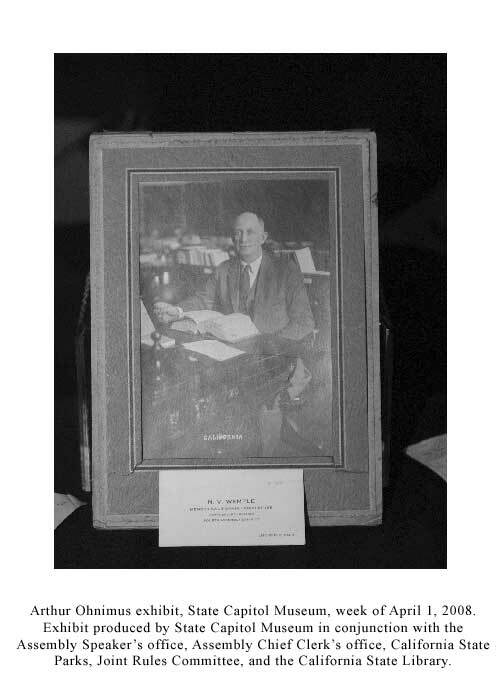 Ohnimus at Member's desk in Assembly Chamber, 1923 (his first year as Chief Clerk). 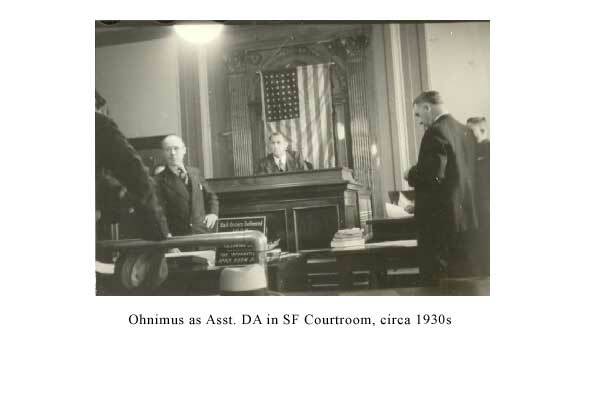 Arthur Ohnimus (in middle), San Francisco, circa 1899. 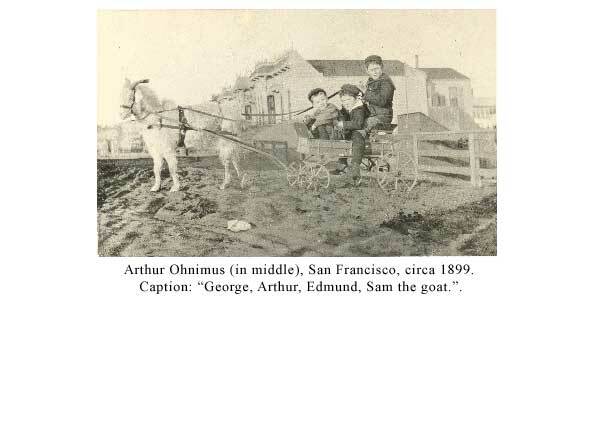 Caption: "George, Arthur, Edmund, Sam the goat." 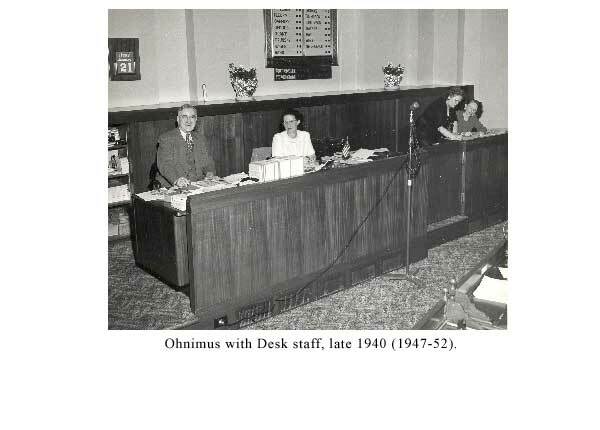 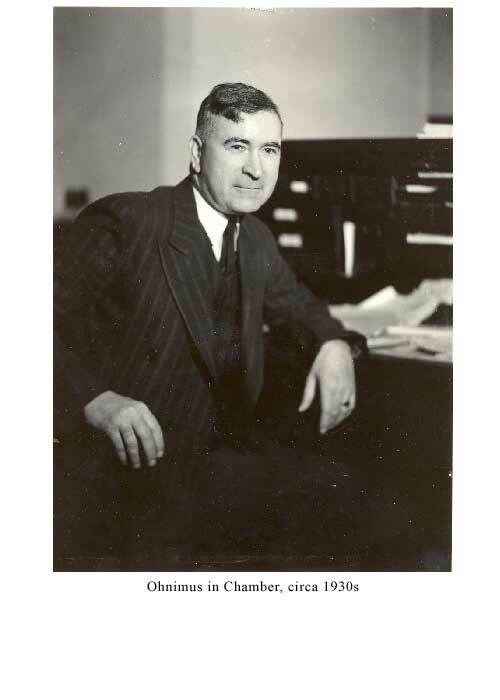 Ohnimus at Chamber desk, circa 1943-46. 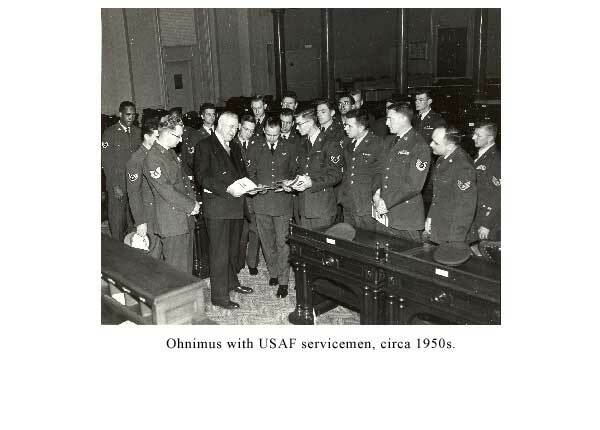 Ohnimus with USAF serviceman, circa 1950s. 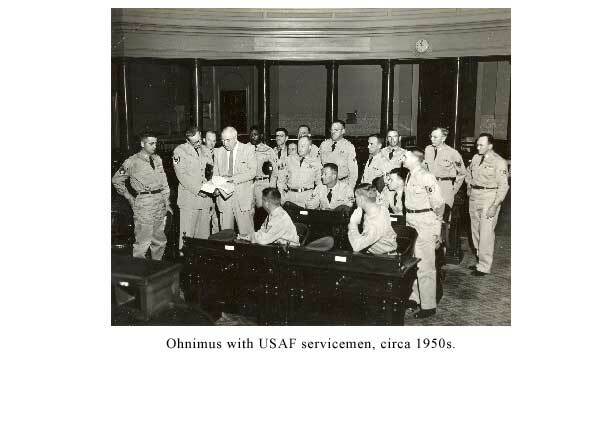 Ohnimus with USAF servicemen, circa 1950s. 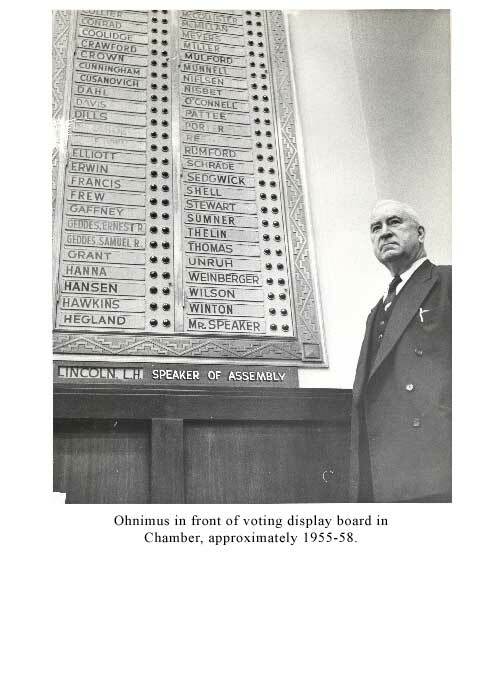 Ohnimus in front of vote panels, circa 1959-61. 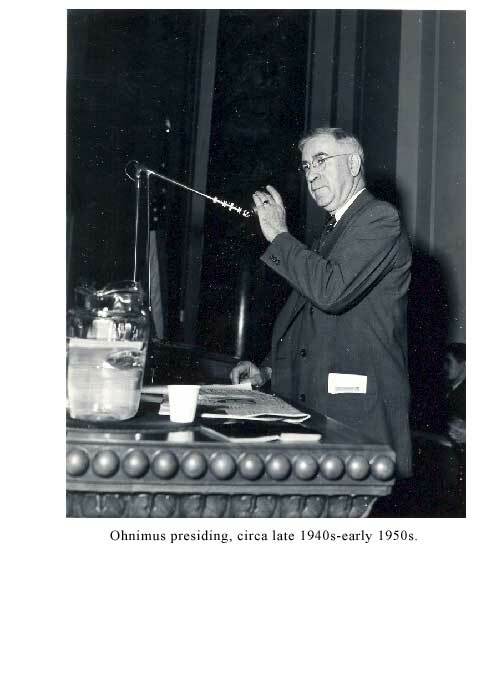 Ohnimus at Assembly Desk microphone in March 1941. 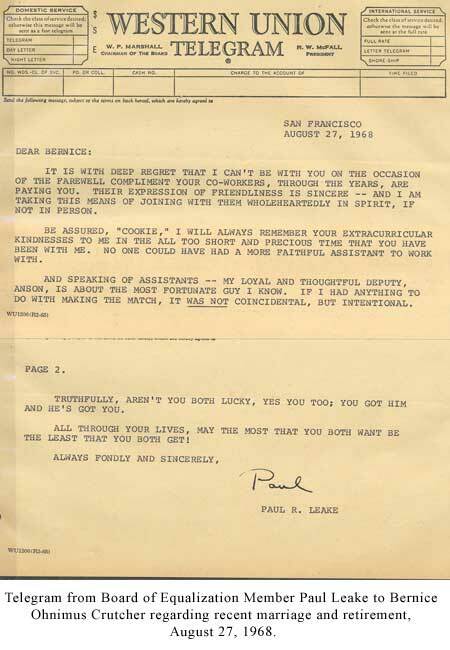 Telegram from Board of Equalization Member Paul Leake to Bernice Ohnimus Crutcher regarding recent marriage and retirement, August 27, 1968. 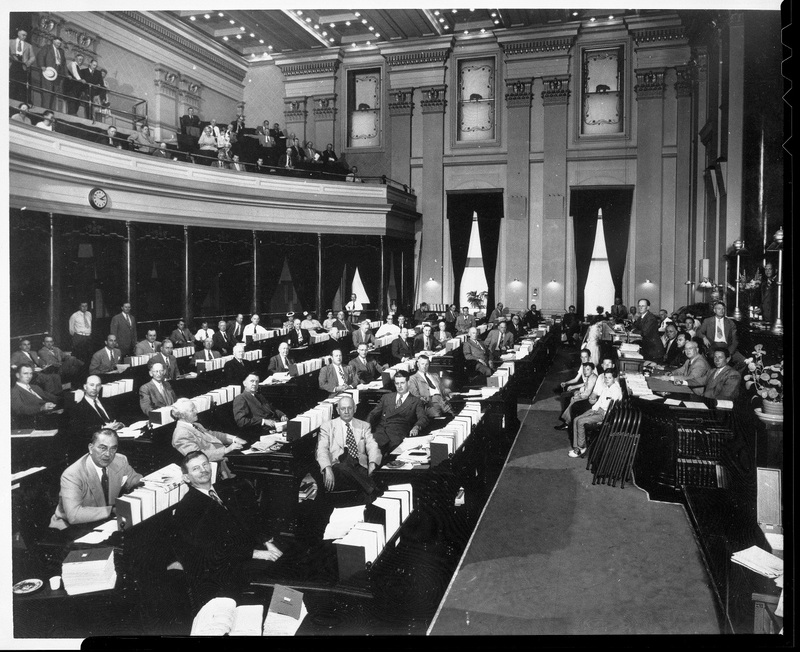 The California Senate in session, c. 1940s. 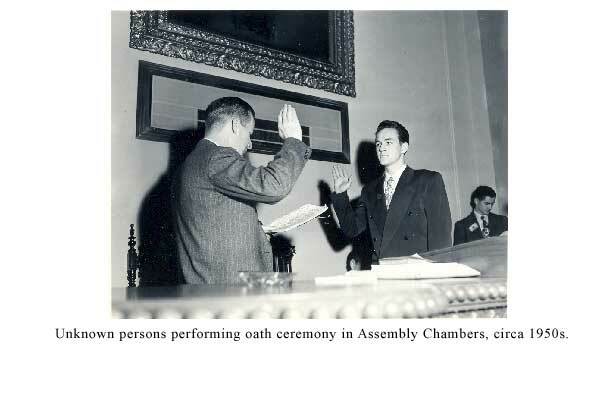 1940s photo showing Joseph Beek and Paul Mason during a session of the California Senate. 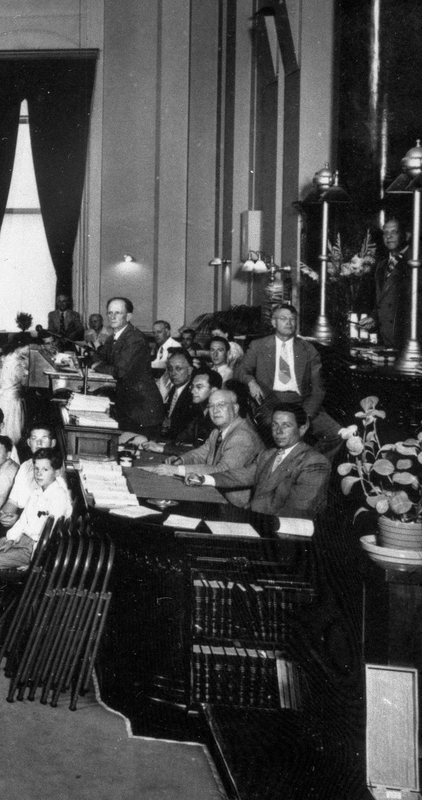 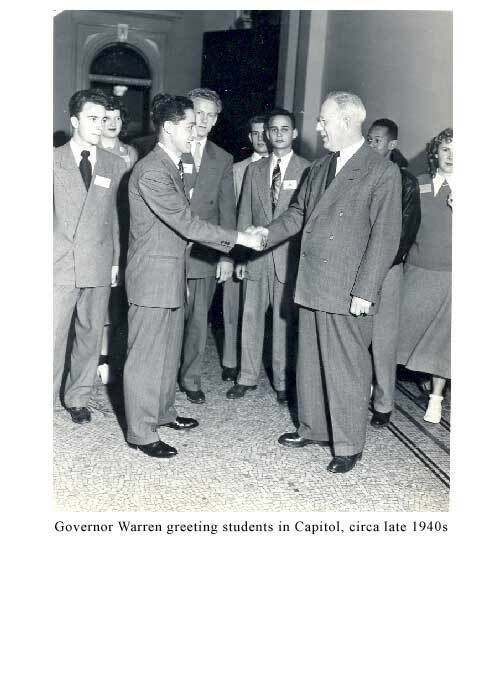 Mr. Beek is standing at the reading clerk’s podium and Mr. Mason is seated on the stool in front of the President of the Senate. 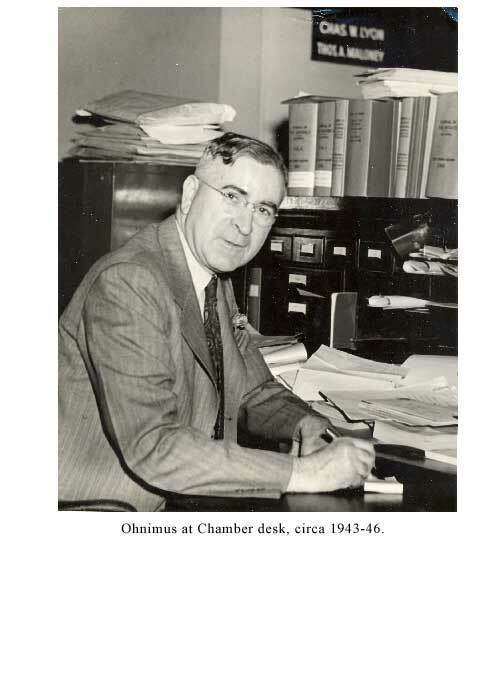 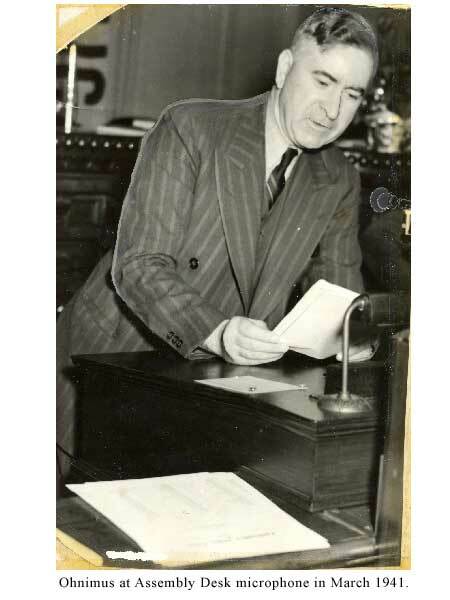 Mr. Beek was Secretary of the Senate for 47 years and founded the American Society of Legislative Clerks and Secretaries, the first national organization for legislative staff. 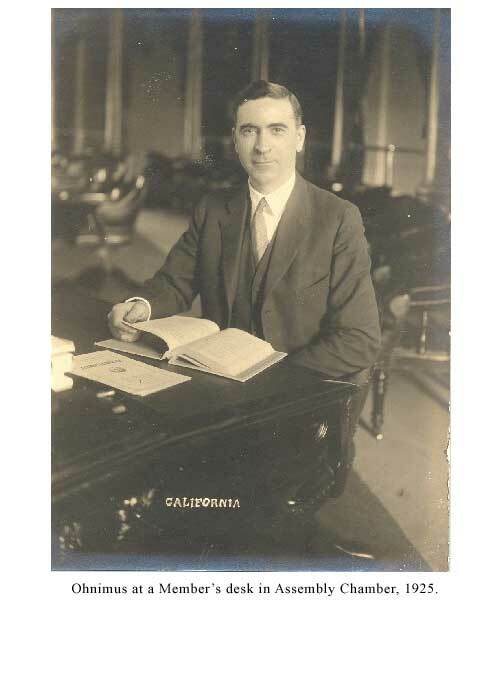 Paul Mason was the Chief Assistant Secretary of the Senate and authored the Constitutional History of California and the Manual of Legislative Procedure. 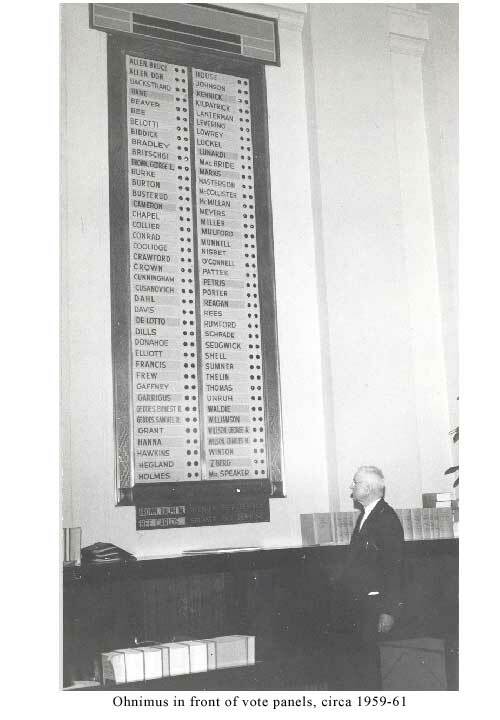 Mason’s Manual is now used as the parliamentary authority by most state legislatures.